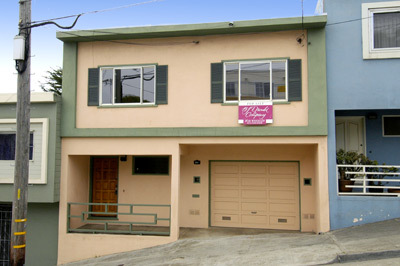 This updated spectacular mid-century home is located in the Sunnyside district of San Francisco. The home has 3 bedrooms, 2 baths, a living room with a wood burning fireplace, a dining room, and a chef caliber kitchen. The home is perched on a hillside with breathtaking views of the surrounding hills. The living space of the home is divided into two levels. On the upper level there is a living room with parquet floors, a dining room with lovely built in maple cabinets, and a kitchen with Italian Marble counter tops. The kitchen also has a Wolf stove with a beautiful hand crafted copper hood from Denmark. There is access to a large deck from the living space from which there are panoramic views. The bathroom on this level has been updated with slate tiles. There are two bedrooms on the upper level with hardwood floors. On the lower level, there is a private bedroom from which there is access to a deck with lovely views. Adjacent to the bedroom is a newly constructed bathroom. From the lower level there is access to a one car garage with a washer & dryer and plenty of storage. Behind the home is a very large outdoor space. This home is in excellent condition. There is a new central heating system, new windows, new roof, and new decks. This wonderful home is walking distance to the shops of Glen Park as well as the Glen Park BART station.